In Kesharpur, a tiny village in the foothills of Orissa's Nayagarh district, villagers search for a baton in their frontyard every morning. Two families find a baton each. The batons decide their day's work -- guarding the forest from timber smugglers and stray grazing. Thengapalli , as this ritual is locally known, was started in 1970 to regenerate and protect the village's forests by Joginath Sahoo, the drum major of the forest movement in Nayagarh (see box: Teaching the world ). After 19 years, the metaphorical baton has spread the message to 600 other villages in the district. The education department of Hampshire county, the uk , found this ritual so impressive that they have included a book on the village in their school curriculum. Now some 18,000 students in 3,500 schools across Hampshire read the story of Kesharpur every day. Similar efforts to protect the forests are on in 28 out of 30 districts of Orissa, though in 16 districts like Dhenkanal, Sambalpur and Mayurbhanj they are on a much larger scale. Driven by simple economic needs, local communities have been protecting forests, mostly degraded reserved forests, since the late 1940s and early 1950s. In fact, the movement started in Dhenkanal as early as 1937 (see box: A tribal revolution ). The present forest protection movement, however, started with the death of Orissa's once-rich tradition of cfm followed by the deforestation in the decades after Independence. In the erstwhile princely states of Bolangir, Sambalpur, Mayurbhanj and Nayagarh, village communities used to protect their forests and share the minor forest produce in a systematic way. Other districts, too, had adequate forest cover before Independence. Sambalpur, Bolangir and Mayurbhanj were, in fact, the first areas in Orissa to get railway connections. Lured by the timber reserves, the British opened railway lines to source their timber needs for ship construction and railway sleepers from these forests. In Nayagarh and Bolangir, the kings gave forests to the villagers for protection in exchange of free fodder and fuelwood, other minor produce and a nominal tax for using the forest. "After Independence, when the kings started losing control over their territories, they allowed large-scale felling by timber merchants," says Nirmalendu Jyotishi, convenor of ojm . "Whatever little of the forests that remained sustained the villagers, who were basically forest dwellers, for hardly a decade," he adds. Severe forest degradation was subsequently followed by soil erosion, drying of water resources and loss of forest-stripping, the villagers' only source of income. Kesharpur was one of the villages which was badly-affected by the depletion of forest resources. The village witnessed severe drought and the agriculture-based economy collapsed. At that point, Narayan Hazary, an educated youth from the village, told his people that the climatic changes were because of the destruction of forests. His message was simple: "No forest, no rain." People listened to him. Similarly, the communities started protecting forests after two years of drought in 1956 and 1965 that ravaged the Bolangir-Kalahandi region. Here, besides the deforestation caused by timber merchants, the construction of the Hirakud dam in the 1950s saw large forest areas being razed. "The immediate impact was the scarcity of fuelwood", says Manoj Patnaik, president of the Regional Council for Cooperation Development ( rcdc ), a non-governmental organisation ( ngo ). Today, wherever there is a forest patch in Bolangir, one can be assured that there is a community protecting it, he says. A fillip to the movement was provided by the introduction of village blocks as a unit and the subsequent introduction of community development programmes by former prime minister Jawaharlal Nehru. "The story of the regeneration of forests and the now famous cfm is the legacy of a deadly past," says the rcdc president. Now forests in 28 out of the 30 districts in the state are under the care of village communities (see table: Protected by people ). In every village, a committee is elected by the people. There is a blanket ban on felling and stray grazing. The committee supervises these bans and resolves all conflicts. It also collects fines, decided by the villagers, for any violation of the protection rules. Similarly, it decides the village peoples' contribution for protection or regeneration of forests. At the block-level, there is a committee formed by a cluster of villages, which settles disputes. Every district has this committee, which includes four to five members from every village. At the district level, there is the federation of village committees, which has representatives from the block-level committees. Finally, at the state-level, there is the Orissa Forest Forum. 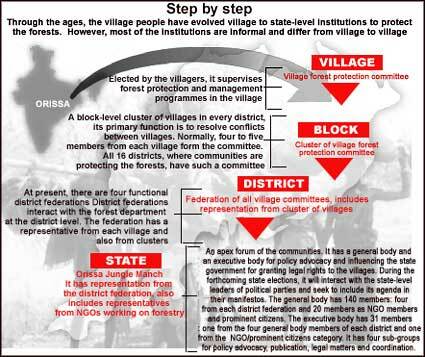 Established by the people to primarily fight for the legal status of forests, this forum comprises members from the district federation, ngo s and the civil society (see chart: Step by step ). However, each and every village differs in the internal structure of its institutions and monitoring of the forest protection activities. "It is village specific and decided by the villagers," says Barna Vaibha Panda, coordinator of Nayagarh Forest Federation. For example, in Koshka village in Nayagarh, Kesharpur's thengapalli (passing the baton) ritual is adopted. While, in some other villages, after the initial years of voluntary parti-cipation by the villagers, they recruit guards. The honorarium for the guards are collected from the villagers. Sharing the minor forest produce and fuelwood is also decided by the villagers. In Bolangir and Mayurbhanj districts, where there are sal and mahua forests, villagers are free to collect sal leaves for making plates, which is a major source of income, and mahua flowers, hill brooms plants and tamarind. In another village, Magarabandh, villagers pay Re 1 for every headload of fuelwood they collect from the protected forest, and once in three months each household pays another rupee towards the salary of the forest guard. Says Kailash Chandra Sahoo of Nayagarh, "This little price that the villagers pay for using the forest make them possessive of the forest and they exercise powers as a stakeholder on it." In the same village, which protects a 810 ha forest patch along with 16 other villages, people are allowed into the forest for two days in a month to collect bamboo and fallen timber. Everybody is allowed to take 20 pieces of bamboo and logs for which they pay the amount fixed by the village committee. The Chadayapalli village of Nayagarh, which protects 1,800 ha of forest land, has a more syste-matic way of collecting and spending the money earned from forest resources. It issues passes for timber and bamboo extraction for fuelwood to villagers twice every week at the rate of Re 1 per piece of bamboo. The village has been earning Rs 90,000 every year in this way. The village school is run on this money and recently the committee spent Rs 3,00,000 for construction of a road to the village, out of which Rs 42,000 was given as compensation for land acquisition to villagers. "We don't depend on government money or the panchayati grant," says Hadubandhu Senapati, former secretary of Chadayapalli's forest protection committee ( fpc) . Today, almost every village, where there is a community protecting the forests, is a success story. "The success of this movement may sound like a fairy tale, but they are real," noted the State of Orissa's Environment , published by the Council for Professional Social Workers, Bhubaneswar. The villages, which could serve as a paradigm for cfm elsewhere, are Budhikhamari in Mayurbanj, Koshka in Nayagarh and Lapanga in Sambalpur. In 1975, a 10,000 ha patch of forest land in Mayurbhanj was almost officially declared non-existent by the forest department. The lone forest guard was told to abandon the beat room inside the forest. "The beat room stands as a mute witness to the senseless felling of the dense sal forests," says Indra Palei, vice-president of the Budhikhamari village forest protection committee. Meanwhile, the district headquarters, Baripada, where the British set up a railway station in 1921, flourished as a trade centre. And the nearby saw mills thrived on this patch of the forest, while people from some 95 villages on the periphery of the forest lost their source of income. Finally, in 1983, after years of drought, a herbal medical practitioner told a village gathering that the village would not survive if the forest was not regenerated. Gorachand Mahato, president of Mayurbhanj's fpc and three of his friends took the advice seriously and made the rounds of 90 households in their village convincing people to protect the forests. "It was an ambitious step as the forest was huge and the situation was such that if one agreed to protect the forest five others would come to destroy it," says Gorachand. Nevertheless, the first step was taken. All extraction from the forest was banned. Five to seven people started patrolling the forest every day, each with a thenga (stick). Villagers were allowed to collect broken twigs and dead branches. The fpc was set up. Its members travelled by bicycles and on foot to other villages surrounding the forest to persuade them to adopt similar protection measures. "Within a year, 15 villages were protecting the same patch of forest," informs the secretary of the fpc, Bishwanath Purti, who is from Dubhiya village. His village fined some villagers who were caught smuggling timber from the regenerating forest. The money collected gave birth to an institution called Purti Society, which now leads the forest protection activities in the village. By 1987, another 20 villages joined Budhikhamari. Today, altogether 95 villages are protecting the 10,000 ha forest. "The forest now provides employment to each and every villager," says Purnachandra Mahato, a villager of Budhikha-mari. Villagers are free to collect all non-timber forest produce ( ntfp ) like sal leaves, mahua and the soboi grass, which is used to make rope. The agricultural income of the villages have also gone up as the nearby stream has turned perennial and supplements the monsoon water for irrigation purpose. "Besides, due to less soil erosion and the natural manure from leaves from the forest, the productivity of the land has also improved," says Suparna Mahato, a village woman who also guards the forest once a week. The beat room of the forest guard still exists in the forests of Budhikhamari but, unlike the years before 1975, it is not occupied by the guard. Instead, jfpc volunteers, who monitor the forests, occupy the rooms. On this occasion, however, the beat room is a silent witness to the rebirth of Budhikhamari. There are no proper roads to Koshka village in Nayagarh. But the 500-odd villagers do not mind. "A long time ago, a road was constructed but it was meant for the timber smugglers. And, in a couple of years, the forest vanished," says Biswanath Bara, a villager who has been involved with the regeneration of the forest since 1970. "We need forests, not roads," he adds. The village's rich sal forest was cleared when it was given on lease to a timber merchant. Koshka's villagers faced the same problems as Budhikhamari's. "As far as the eye could see, there was no source of fuelwood. The shortage was so severe that it changed our food habit," remembers Shanti, a villager. During the late 1960s, the villagers remember that they had to put curbs on their cooking too. "We had to leave home early, without breakfast, to search for fuelwood. Sometimes when we didn't find any firewood, we used to steal bamboo from fences on rich farmers' lands," says Shanti, who now keeps fuelwood stocked for the entire year. "It was then that the villagers realised the link between the forest and the monsoon," says Rajkishore Baruha, one of the first villagers to start protecting the forests. Today, the 142-ha sal forest is so dense that even villagers who guard the forest cannot enter it. "Forest protection is no more an economic acti-vity, it is a social value. We don't harm a tree, even if it is dead," says Basant Patra, a villager. The villagers are so passionate about forests that they even exercise control over the patch of reserve forest they did not protect earlier. In 1982, when the state government started clearing a nearby 364 ha reserve forest for cashew plantation, the villagers encircled the forest and guarded it round-the-clock. Only when the officials beat a retreat, did the villagers 'hand over' the forest to the forest department. "It shows our commitment, not interest," says Patra preparing for his turn to guard the forest. A government employee, Patra was on leave the day this reporter met him for a 'commitment'. On a revenue map, Lapanga is a 'big' village. What is not shown is that two-thirds of its area has been submerged by the Hirakud dam's reservoir and the rest (81 ha) is a dense forest. For all practical purposes, the village has been reduced in size for two interests: national (the Hirakud dam) and survival (forests on private lands). Some 40 km from Sambalpur, Lapanga is the oldest recorded village to have started cfm . These measures were launched as early as 1936. A billboard "Lapanga's Prjarakshit Jungle (People protected forest of Lapanga) Welcomes You" greets you on entering the village. Though researchers and forest officials recognise the villagers' commitment to forest protection, nobody recognises the most important aspect of its protection measure -- individual sacrifices to create the forest. In 1936, some villagers, who were landholders and dependent on agriculture for survival, donated 40 ha of land adjacent to the village forest so that the forest could grow in size and sustain the people. "It's a perfect example of community life where a section of villagers helped in generating resources for another section," says Radhamadhav Das, who also donated land for the forest and was the village's president for 18 years. During the 1920s, even after massive destruction of the forests, the region still possessed dense forests. "The forests were dense so nobody bothered. But the distance between the village and the forest started increasing," says Das. They then requested the British rulers to assess the situation. A semi-judicial body called "Gauntia Panch" was set up in 1936, which declared exemption from land tax to those protecting forests. The villagers went a step further and donated their lands too. The village fpc, which was established then, still takes stock of protection measures in the village. While the committee meets once a year, all the village people participate in the annual meeting where new office-bearers are elected. Every two years, one-third of the committee members are changed. However, it is compulsory to include members from families that have donated lands. Villagers are free to collect ntfp and fuelwood. Once a patch of forest is harvested, it is protected from the villagers for 5-10 years. The forest was harvested in 1953 for the first time. Thereafter, it has been done in a cycle of three to five years. Recently the forest department requested the village to adopt jfm , but the villagers refused saying they don't want to share the resources. Earlier, the forest department went to court against the villagers for harvesting the forest. But the court ruled that "it was on private lands".